Puppeteer-Sharp crashes with exceptions which cannot be caught. // Catches most exceptions such as timeouts but does not catch others, see below. // Never enters the catch. How is it possible that a try-catch block can’t catch an Exception? Avoid async void! It is possible to have an async method return void, but you should only do this if you’re writing an async event handler. A regular async method without a return value should return Task, not void. But many times I got in a situation where I needed to code an async void event. It looked like a perfect excuse: “I know that async void is bad. But I need to code an async Event handler, so I have to use async voids. I’m following the rules, everything will be ok”. When an async void method propagates an exception, that exception is raised on ​​the SynchronizationContext that was active at the time the async void method started executing. If your execution environment provides a SynchronizationContext, then it usually has a way to handle these top-level exceptions at a global scope. For example, WPF has Application.DispatcherUnhandledException, WinRT has Application.UnhandledException and ASP.NET has Application_Error. But, as Ben said, in a console app, the exception will be propagated to the ThreadPool without being caught, taking down the entire process. Where are those async voids? You might be thinking: “Ok, but why are you talking about async voids? that piece of code has no async void?” Well, async voids event handlers are being used internally by Puppeteer. So, from Puppeteer.LaunchAsync to the Dispose being called by the using block, many events will be triggered internally. When a new message comes from Chromium, an IConnectionTransport would parse and then broadcast it using the MessageReceived event. Many classes, like the Page class, would listen to events coming from the connection and perform asynchronous tasks. And here we have our async voids. No just kidding we didn’t even find the bug yet. Is async void the problem? This past week I was obsessed with this async void issue. I considered replacing those events calls with other tools, such us DataFlows or System.Reactive, but I wasn’t able to find a clean and (most important) right solution. How is it possible that the man who knows most about asynchronous programming tells me that? Isn’t async void the root of all evil? A simplified sequence diagram will look like this. So let’s say that we fail to process Target.targetCreated. What line on the user code will fail? Easy, browser.NewPageAsync But what if we fail to process Target.targetInfoChanged? There is no way we can send that exception to the user because the user didn’t trigger that action. This was a really ugly problem on Puppeteer-Sharp, not being able to communicate internal errors to the user. If your library consumes events from another source you need to be extremely careful with your exception handling and design your API, so you are able to communicate those exceptions. Puppeteer-Sharp has two types of connections. The Connection itself, one per process. And a Session connection, one per target. So, we added a try-catch block on every MessageReceived event we have in the library. If we get any error, we close the connection, and we add that exception as a close reason. KeyNotFoundException trying to get a Frame … What? 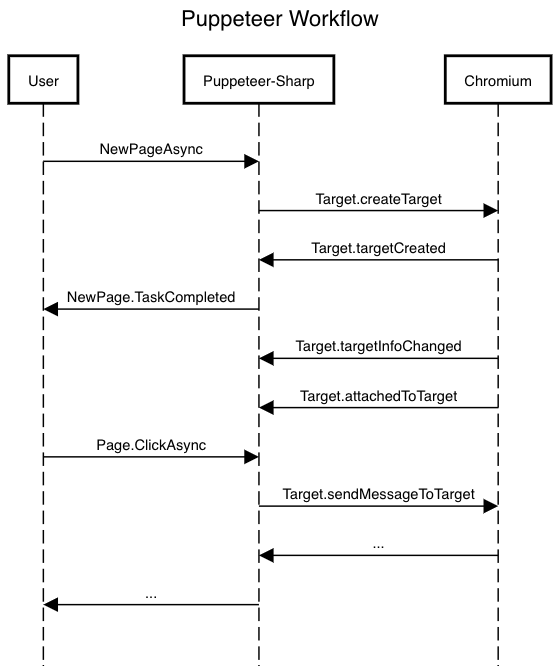 If you take a look at the sequence diagram again, you will see that the first message we get from Chromium is “Target.targetCreated”. How is it possible that we are getting a KeyNotFoundException exception? I’ll give you a hint, it begins with async and ends with void. An IConnectionTransport will start receiving a stream of messages from Chromium, parse them and trigger a MessageReceived event. The problem here is that MessageReceived?.Invoke will trigger and forget an async void event handler. Of Course! there is not await involved! This will be a fire and forget. The downside to async void events is that developers no longer have full control over when events execute. For example, if both an .aspx and a .Master define Page_Load events, and one or both of them are asynchronous, the order of execution can’t be guaranteed. The same indeterminate order for non event handlers (such as async void Button_Click ) applies. Of course, the order of execution can’t be guaranteed, because **the Invoke method won’t await your async event handlers. Wait for frames to be created. Although this might sound too Puppeteer-Sharp specific, I think it gives us, some interesting things to consider when designing a library that consumes events for another source.